Key difference: HTML stands for HyperText Markup Language. It is a well known mark up language used to develop web pages. It has been around for a long time and is commonly used in webpage design. Plain Text, on the other hand, is the basic interchangeable content of text. It is just a string of ASCII characters in a human-readable form. Essentially, it is just words without any formatting whatsoever. There are two main common file formats, other than the Microsoft word .doc or .docx. These formats are HTML or Plain Text. They are also the two formats in which most e-mails are formatted before sending. HTML stands for HyperText Markup Language. It is a well known mark up language used to develop web pages. It has been around for a long time and is commonly used in webpage design. XML or Extensible Markup Language defines a set of rules for encoding documents in a format that can be read by both, human and computer. HTML is written using HTML elements, which consist of tags, primarily and opening tag and a closing tag. The data between these tags is usually the content. 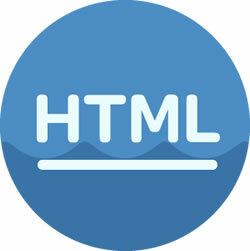 The main objective of HTML is to allow web browsers to interpret and display the content written between the tags. The tags are designed to describe the page content. HTML comes with predefined tags. They allow one to insert images, text, videos, forms and other pieces of content together into a cohesive webpage. Plain Text, on the other hand, is the basic interchangeable content of text. It is just a string of ASCII characters in a human-readable form. Essentially, it is just words without any formatting whatsoever, whereas HTML allows to bold, italic, underline, change fonts, change size, etc. of the words. The plain text does not; it is just the words and nothing else. 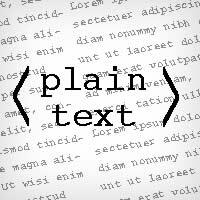 The advantage of Plain Text is that is can be read with practically any program, text reader/editor or e-mail client. There are even some program, text reader/editor or e-mail clients that do not support or read HTML. Sending a Plain Text e-mail, as opposed to an HTML e-mail or a rich text e-mail has its advantages. As stated some old text based e-mail clients cannot display HTML messages, however they will have to problem with a plain text e-mail. Also, spam filters are less likely to filter a plain text message than an HTML e-mail. Furthermore, a plain text message is much smaller in size than an HTML message.